A Mexican-American take on In-n-Out Burger. A strip mall ramen shop. A soft serve ice cream stand. A Latin American cafe. 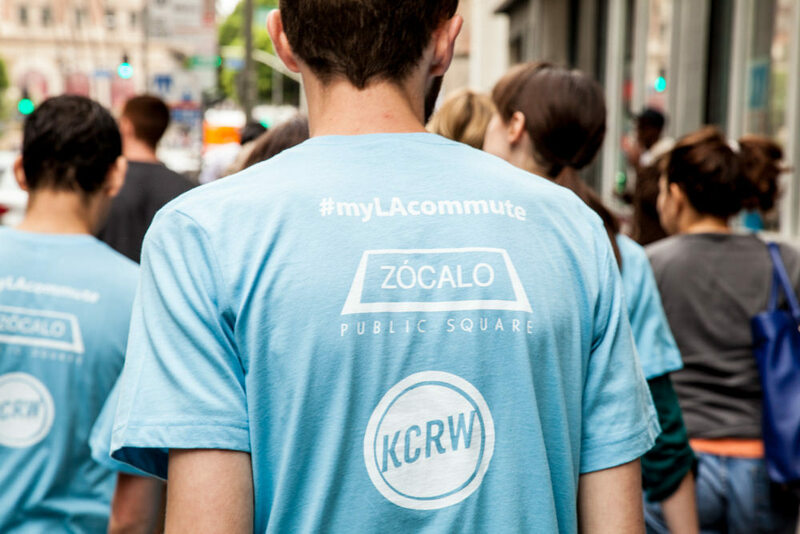 Four restaurants in four Los Angeles neighborhoods, all served by one bus line—the Rapid 720—and all part of the inaugural Metro Tour de Food, presented by Zócalo, Metro, and KCRW. An intrepid, multigenerational crowd of hungry Angelenos—many clad in matching blue “Tour de Food” T-shirts—gathered on the sidewalk in front of Hamburguesas Punta Cabras (633 South Spring Street) in downtown’s historic core to kick off their Saturday afternoon. Leading the tour was East L.A. native Javier Cabral (also known as “The Glutster”), who explained that he grew up riding Metro, and when he became a professional food writer at the tender age of 16, one of the ways he discovered new restaurants was from the bus window. He was hoping to impart a bit of that experience to tour participants over the course of the afternoon. Cabral said that the concept behind Hamburguesas Punta Cabras is a fast-casual, Mexican-American hamburger joint. “It’s like your childhood nostalgic favorite burger, at a similar price point but very high quality,” he said. Alongside hamburgers, turkey burgers, black bean veggie burgers, and fries, Hamburguesas Punta Cabras serve “dirty fries” with a chorizo gravy (as well as cilantro, tomato, onion, and a dressing that tastes like Thousand Island), a nod to poutine by co-chef/owner Daniel Snukal, who grew up in Canada. Another tour participant, Megan Wintermantel, lauded the uniqueness of the dirty fries, a melding of flavors she hadn’t experienced before. After enjoying their burgers, fries, and sodas, the group headed up to 6th Street to catch the 720. It wasn’t a chartered bus—so Tour de Food participants rode with other Angelenos going about their business. It was the first bus ride for one baby (accompanied by his parents) and the first bus ride in over a decade for another participant. A number of people said that while they had taken the bus regularly when they lived in different parts of the world—Hong Kong, France, the Bay Area—they did not take it often in Los Angeles. At the next stop, Cabral said that he feels the Rapid 720 is “an underrated commute run.” Many of the immigrant workers at restaurants in Santa Monica, Beverly Hills, and the Miracle Mile live further east; if you ride the 720 late at night, you’ll see many a dishwasher and line cook sleeping on their rides home to places like Koreatown and Boyle Heights. 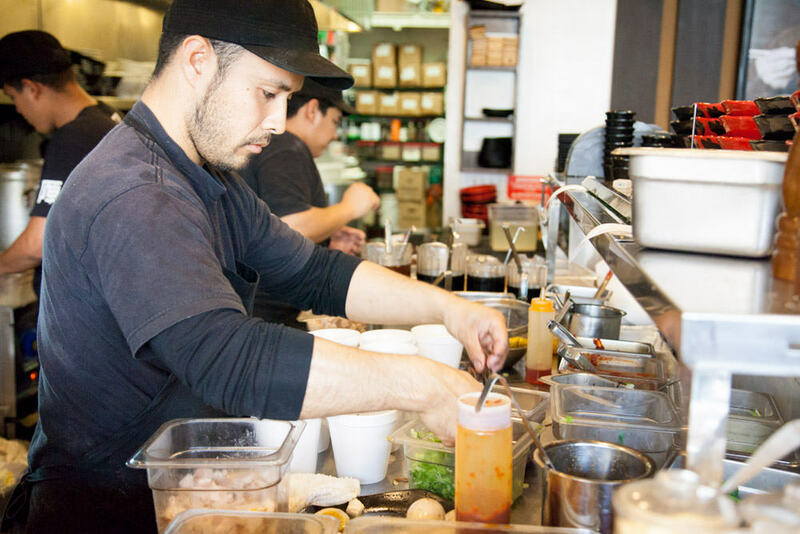 Standing in front of a Miracle Mile strip mall, Cabral introduced Jinya Ramen Bar (5168 Wilshire Boulevard). Ramen, he said, is finally getting the respect it deserves in L.A. “It’s only a matter of time until it’s as synonymous with Japanese food as sushi,” he said. 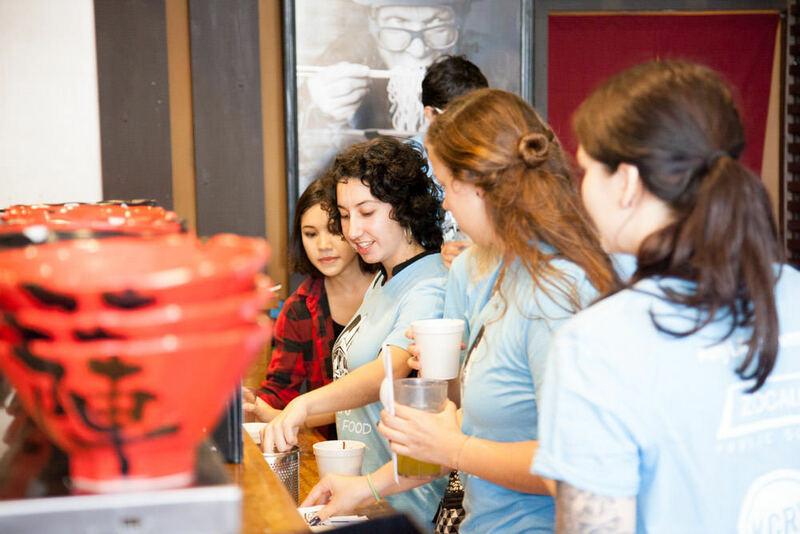 Cabral added that tour participants would be enjoying ramen alongside iced green matcha tea. 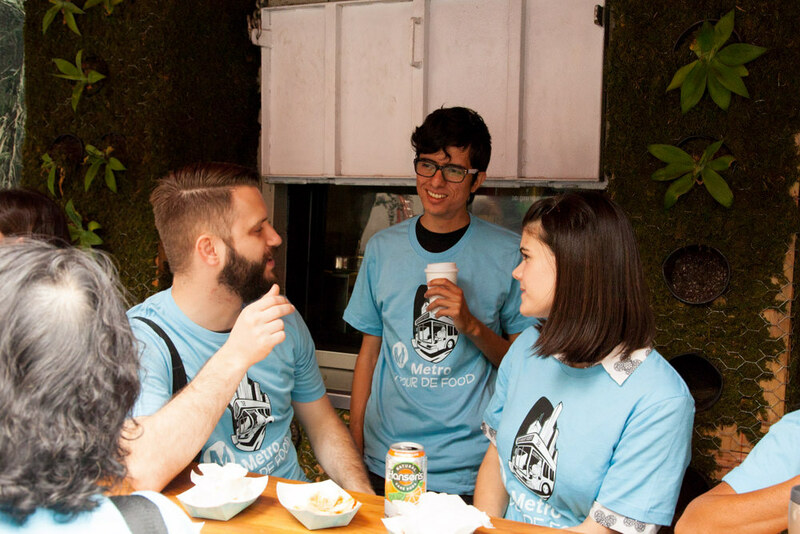 He said that the cool tea is refreshing when paired with the hot, rich soup, and likened it to drinking a Mexican Coke with tacos or beer with a burger. As everyone slurped up bowls of tonkotsu black ramen, Jinya employee Tracy Nguyen explained that the name comes from the black garlic oil that is added to the rich pork broth, along with thin noodles, pork chashu (which is similar to pork belly), and a soft-boiled egg. A number of tour participants called the egg a highlight of the day’s eats. 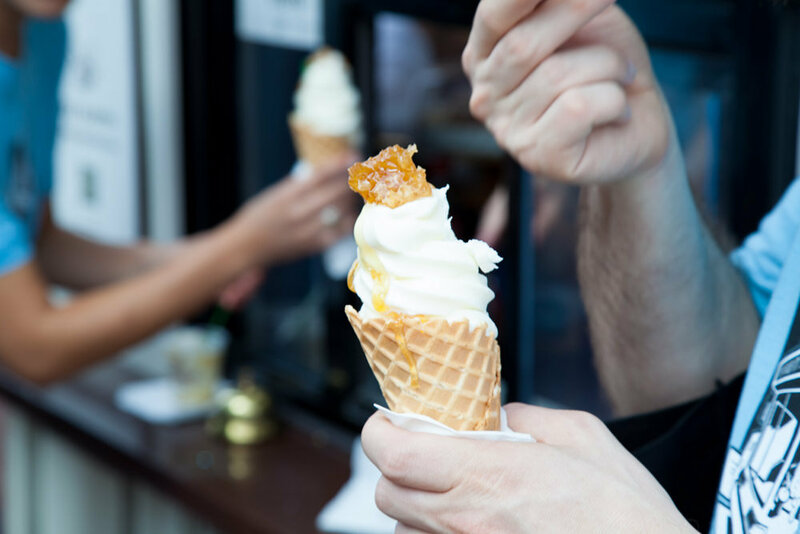 Then it was back on the bus, heading east for a mid-afternoon treat: milk-flavor ice cream at Honeymee (3377 Wilshire Boulevard)—a soft serve stand that wouldn’t look out of place at the beach but is located in a mall in the heart of Koreatown. Other tour participants enjoyed ice cream sandwiches on sweet buns and ice cream topped with honey or chocolate sauce and sea salt. As the sun came out, they agreed that it was a refreshing (if decadent) stop. Tour participants Anne Croucier and Nadine Bailly were impressed by the quality and quantity of the food, as well as their experiences on the bus, which they don’t ride frequently in Los Angeles. They said that they’d met a man on the bus who, hearing they were on a food tour, gave them a list of his recommended downtown restaurants. “He was so cool!” said Croucier. 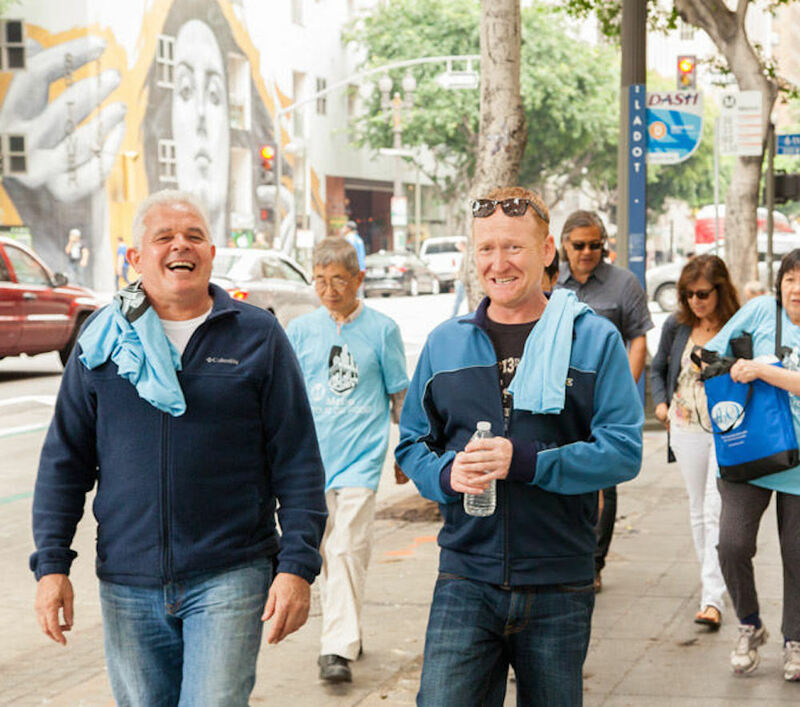 The group hopped back on the 720 and headed east to MacArthur Park, passing by street vendors selling corn, mango, bacon-wrapped hot dogs, and more. But their destination was Mama’s Hot Tamales (2124 West 7th Street), where pupusas were flying off a griddle outside and platters with assorted tamales and pineapple, tamarind, and jamaica aguas frescas were waiting for them inside the colorful cafe. 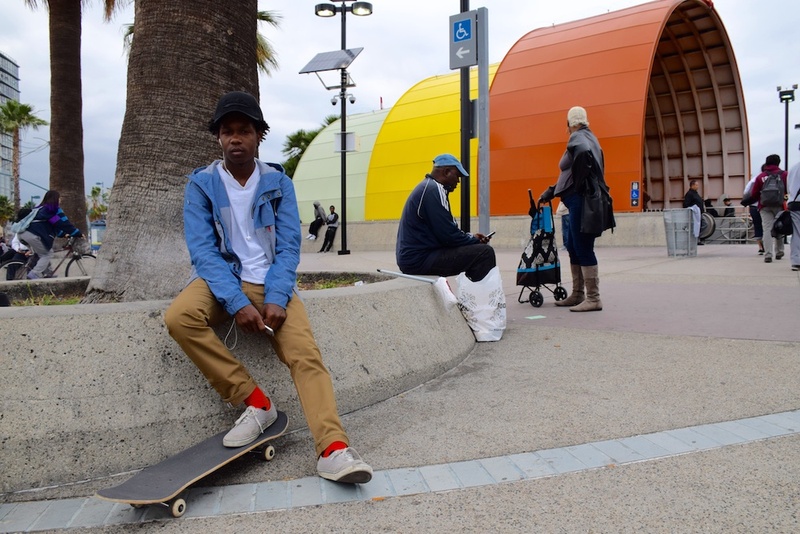 Cabral called Mama’s “kind of an institution in its own right.” In the 1990s, he explained, street vending briefly became legal in Los Angeles—but only within MacArthur Park. It didn’t last, but the vendors stayed on, and Mama’s helps them out by renting out its kitchen to vendors and others by the hour. Mama’s employee Norma Lopez told the group that her family made Salvadoran candy in Mama’s kitchen and became “kind of like her students.” Now, they run the cafe. It’s “a prime example of how this place helps out the community,” she said. But that wasn’t the only thing participants had learned.